If you’re looking to start a career in copywriting, you need a CCC. I hear so many wannabe copywriters crying about not being able to get a copywriting gig, and it’s no wonder…..they do zero prep-work! Finding a small copywriting job is the same as finding a regular job: It requires some upfront effort and organization. There’s no better way to start of the hunt for a copywriting gig than by mapping out a plan to get those gigs. If you walk into this with no plan, no place to list out contact info, gigs etc….you are unlikely to succeed. But what if you just made a small Google Spreadsheet with some rudimentary information on how/where to get started? Places you’d like to write for. Contact info. Places jobs are posted w/ links. Groups to join w/ links. 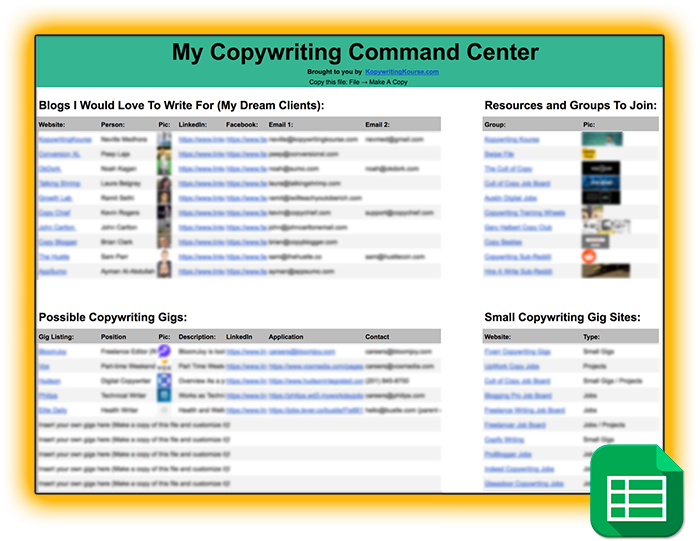 Simply creating a “Command Center” can greatly increase your odds of success in copywriting! P.P.P.S. Feel free to make a copy of the file. Just do File –> Make A Copy inside the spreadsheet.